From a distance Mary spotted a warning label on the frame and into her head popped the thought that it might read "Warning this gate may contain cats!" 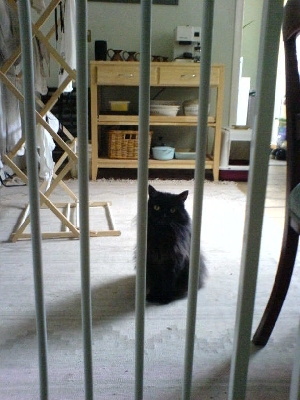 We do let her out into the garden but without a cat flap this is a human-operated cat kitchen-back-door. Tuesday afternoon our friend John, who is doing a bit of decorating for us, let Cleo out. And would she come back in? No, the little Minx ran away whenever John got near and would not be herded. So she was locked out until Mary got home from Italian class at 9:30pm. In Cleo rushed with much loud protesting! That'll teach her (maybe, maybe not).